The submission guidelines are currently being revised. For more information, contact the Editor-In-Chief of Le Cygne, Glyn S. Burgess at af02@liverpool.ac.uk. 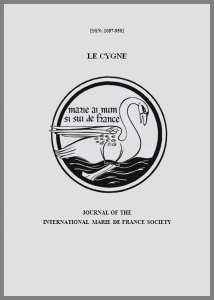 – Le Cygne: Journal of The International Marie de France Society is issued once a year, in the Fall. As a refereed journal, it is indexed in the MLA Bibliography. – Submissions on any of the works of Marie de France and other Breton lais are invited. – Le Cygne will review only those articles that are not under consideration by other journals. We publish only articles that have not been accepted for publications elsewhere. – Contributions may be in English or French. – Le Cygne subscripts to a policy of blind submissions. Each article will be reviewed by two readers from the journal’s Advisory Board. The author’s name, address, institution, telephone number, and email address should be listed on a separate cover sheet. Necessary references to the author’s previous scholarship should be in the third person. – The maxiumum length for articles (including the endnotes and bibliography) is 6,000 words. – Submissions to Le Cygne should be prepared according to the MLA Style Manual and Guide to Scholarly Publishing. The author is responsible for accuracy of quotations and citations. – Criteria for acceptance include: discussion of significant ideas; relevance to contemporary critical discussions; groundbreaking research or new theoretical approaches to ongoing debates. – Two to three articles are published in each volume (except for special issues). – The time between submission and publication decision is 6-9 months and between publication decision and publication 12-18 months. – Final version of accepted articles must be submitted as electronic attachments.